This week I thought we'd have a seasonal image - but then I though why stop at one - why not have a few? How to participate in "Who painted this? #9"
Media used: oil on copper; Height: 41.9 cm (16.5 in). Width: 76.9 cm (30.3 in). 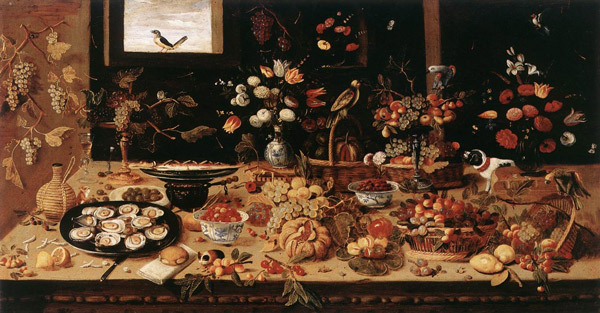 Jan van Kessel the Elder painted still lifes around about about the same time as Vermeer was painting people in his studio. van Kessel painted with the extreme levels of representation associated with a miniaturist, although his works were not small. He seems to be very fond of natural things - including animals. I very much like his paintings which combine botanical subject matter with natural history in much the same way Maria Sybilla Merian did. This is a man who liked painting collections of items - his paintings of birds assemble a great number of different birds all in one spot! A search on Google for nativity paintings brought this image up on page 16. I don't know who painted this but it sure is lovely! Agreed - I looked at a few before settling on this one. Good morning Katherine. I so look forward to this on Sat. mornings. So this is what I have come up with...I started my search on google with the phrase "large triptych of the nativity" and off I went. I found that the name of this piece is "The Nativity" painted in the mid 15th century in the workshop of Rogier van der Weyden. It is oil and tempura and it lives at the NY Metropolitan Museum of Art. The first researches around Nativity polyptych leads me first to Rogier van der Weyden, and mainly to the central figure of Marie in contrapposto under the wood architecture : quite exactly the same that in the Bladelin's triptych by van der Weyden. The most difficult was done. And if I could say a word more : as a French who had the chance to see the Van der Weyden's Last Judgment polyptych in Beaune, it remains one of my strongest painting emotion. Thanks for the play – and merry end of the year! Hi Katherine, a very educational journey! Thank you. 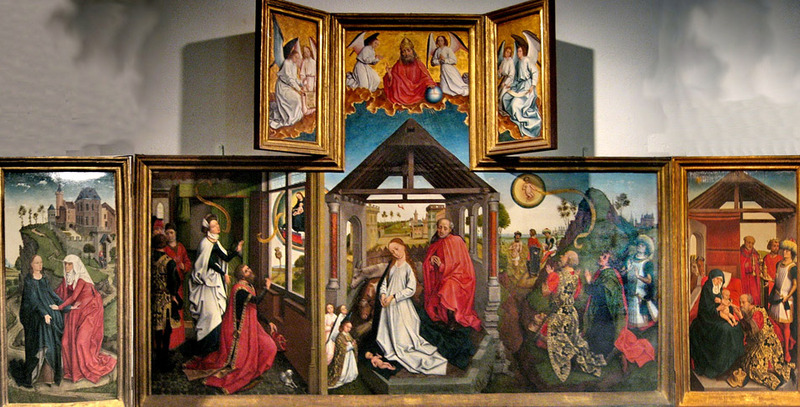 The work seemed obviously medieval (the style), an altarpiece (the folding frames) and a Nativity story (from the Annuciation on the left to the Adoration of the Magi on the right). So I Googled "old Christmas altarpiece". In the first page of image hits was what appeared to be the left hand side of your central panel, at http://www.thecanadianencyclopedia.com/articles/christmas-in-canada. It was identified as the Middelburg Altarpiece in the Gemaldegalerie, Berlin, painted by Rogier van der Weyden in c 1445-48. However, checking with the museum, which is in the Google Art Project, showed that this isn't the piece, rather its central panel uses a very similar composition, apparently by the same artist. title of the artwork: only "The Nativity"
tried a different tack of reading up on the subject instead. I finally ended up on wiki under Nativity of Jesus in Art and saw one with similarities by Rogier van der Weyden (Roger de Pasture was his original name in French) so went on the the page about him and there it was. PS It says on the Met website that 2 small outer wings were removed and are in private collection. I'm now getting picky on correctness. The first two answers from Speedy Sue and Irene were almost correct/complete but not quite. In fact, the first absolutely correct/complete answer came from Jean-Baptiste Pelardon who also spotted the fact that it was that unusual format - the polyptych - and was NOT painted in its entirety by Rogier van der Weyden! A delayed Who's made a mark this week? 2nd December 2012 - Who's made a mark this week?